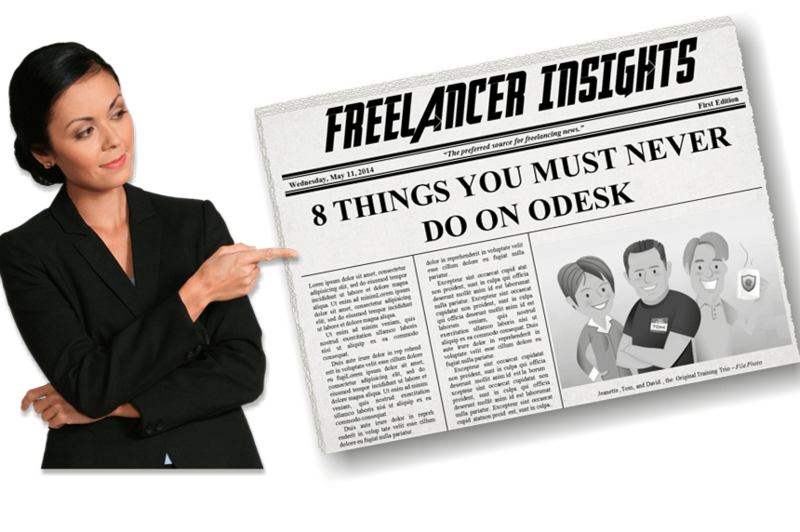 “Rules are meant to be broken…” he he he yes they are but there are 8 things you must never do on oDesk to ensure that you have a successful freelancing career. This are the “Don’ts” that all freelancers hoping to have successful careers on oDesk or anywhere else should steer clear of. This is because they can kill your oDesk career in a second. Other than that, some of them may prevent you from securing any jobs or get you suspended. i) Only maintain one oDesk user account. It is not only unprofessional to have more than one account, it is untrustworthy. Do not make people wonder what your intentions are. In addition to that, you will be banned from oDesk if found out. Just imagine getting your account suspended or having yourself expelled with probably loads of $$$$$$$ in your account. The money will disappear into thin air. Be ethical: only open one odesk account. ii) Never Buy an oDesk account. It is not once or twice that I have seen people selling oDesk accounts. I recently came across one on facebook. A brand new account for sale for roughly $100 hmmmmmm. For heaven’s sake, it is free to create an odesk account and it does not even take more than 30 minutes from start to finish. The repercussions of buying an odesk account are severe just to give a scenario. It is important to verify your odesk account once it is created. Just imagine what will happen when you try to verify an account in someone elses’ name ? Thank me later. iv) Never provide your contacts to the client during job application even upon request. This is one of those don’ts’ that is as confusing as ever. Most of the clients that hire on odesk never read the rules.Yes, they never. They are not supposed to ask for contacts before the interview but on multiple occasions you find clients requesting for contacts in the job posting. See Screenshot below. NOTE: Only provide your contacts once your job application has been accepted or you have been invited to a job interview.All communications prior to this should happen through the oDesk messaging platform. If you want to learn more about the debate on whether or not to provide your contacts check out the odesk forum post. v) Never accept payments outside the oDesk platform. Many will agree with me but some will not. If you have not been in such a position wait for it. It will come. You get hired by a client but they want to pay you through paypal or some other mode of payment. I smell something fishy! What do you do, do you accept the job and payment outside the odesk platform? The questions, thoughts (probably you have had a drought with odesk contracts and an opportunity just presented itself), the head scratching moments. ha ha ha yes I know that you are debating on whether to accept or not. My advice : Do not accept payment outside the odesk platform. You never know when the client will bolt out on you! Odesk ensures you get paid for all your hourly jobs, and protects your personal information by giving you the power to control your finances by choosing how or when to transfer your money. If any disputes arise, odesk will help you (the freelancer) and the client sort out the disagreement and if money was involved then it is easier for you to get paid. vi) Never use fake names or nick names when creating your oDesk account. This is very important in cases where you need to verify your account, or if there is a dispute with your account. Wrong information may make it impossible to handle any disputes, which may result in your account getting suspended or even your account being closed down. vii) Never argue with a client, and respect all your clients. Maintaining a good relationship with clients ensures repeat clients, hence putting you at a better chance of getting more offers. It doesn’t matter who is wrong. Be Calm and work on resolving your issues in a mature and respectful manner. If the dispute boils over to a point that you have your client is hurling insults and hurting words,be calm, raise the issue with the oDesk dispute team. viii) Never use short forms or abbreviations in your communications. Have you ever been in a conversation where a short form of a word is said and you just got lost in the thick of trying to find out what the word means.I have and it is not good. A short form or an abbreviation that you commonly use may not be easily understandable to everybody. If you want to use short forms or any abbreviations, ensure you indicate the meaning of the word for example(As Soon As Possible – A.S.A.P) so that if you use the short form in the future the person you are in communication with will be aware of what you mean. Using shortforms without any prior notification is unprofessional and often leads to miscommunication, which is detrimental to your oDesk career.